The first library in St. Joseph was founded by volunteers from the St. Joseph Women’s Club in 1929 in a room of a local beauty shop. Later that same year the collection was moved to the St. Joseph High School. In 1956, a new building was provided by Mrs. Maude Davis in honor of her parents. The new building was built at 201 N. Third Street and was to be known as the Swearingen Memorial Library. A trust was established by Mrs. Davis upon her death to provide for the maintenance of the building. Members of the St. Joseph Women’s Club continued to volunteer their time to staff the library. In 1973, a referendum was passed by the Township of St. Joseph to establish a tax base for the library. At this time, a Library Board of Directors was elected and a Librarian was hired. The library was renamed the St. Joseph Township - Swearingen Memorial Library. In 1988, the library received a state grant to expand the existing structure and was temporarily closed for renovation. The library reopened in February 1989 with its current layout and design. Come and become a part of the history of St. Joseph. You can purchase a commemorative brick by downloading the form below and returning it to the library. 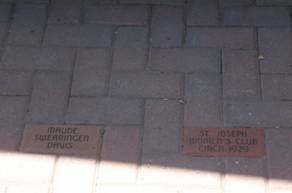 The bricks in the front walkway can be engraved to commemorate someone special or celebrate a milestone. For more information, please contact the library.